Growing up in the ‘80s, I assumed I was part of the generation that had the best kids’ toys: G.I. Joe, Transformers, Voltron. 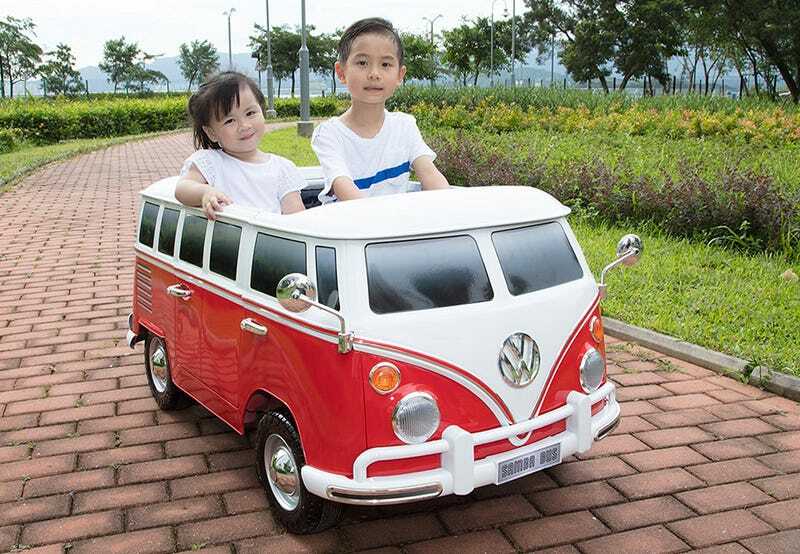 But after discovering this flawless miniature Volkswagen Camper Van that can actually be driven by a couple of toddlers, I’m genuinely envious of four-year-olds. Yes, I realize the adult version of the VW Camper Van is probably even more fun to drive, but can I find one of those for $400? Nope. Can I find one powered by a rechargeable 12-volt electric battery? Nope. Could I even find one with headlights that still worked? It probably wouldn’t be easy. This one has all of those features, plus sound effects, a tiny trunk in the back, three-speeds (including reverse), and working doors. Most ride-on toys look like caricatures of the original vehicles they’re based on, but Beyond Infinity has done a fantastic job of preserving the proportions and overall design of this iconic vehicle. Even Lego’s version of the VW Camper Van doesn’t look this good. The toy even manages to include a few modern creature comforts, like a power gauge indicating how much juice the battery has remaining. You’ll even find a USB port on the dashboard for connecting a media player so your kids can blast Canned Heat’s “Going up the Country” as they cruise around the neighborhood. Or Raffi, they’re both equally groovy.